Other common precursors are ethylene and acetylene. Acetylene can also be decomposed at lower temperature and at pressures up to 1 atm, in the presence of a nickel catalyst. Another common precursor is propylene which decomposes in the 1000-1400C temperature range at low pressure. Deposition mechanism: The pyrolysis of a hydrocarbon, such as shown in reaction equation (a), is actually a series of more complex reactions involving molecules of gradually increasing size. 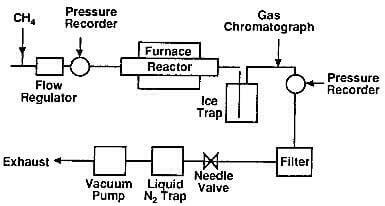 A possible mechanism of deposition of pyrolytic graphite is deduced from a series of experiments carried out in the apparatus shown in fig.7.1. In this article, a spectrographic analysis of the by-products of the decomposition of methane revealed the presence of large amounts of acetylene, ethylene, and benzene, plus a variety of compounds consisting mostly of the polyaromatic hydrocarbons such as naphthalene, anthracene, phenantrene, acenapthylene, pyrene, and fluoranthene, in addition to the deposited pyrolytic grpahite. Some of these compounds form the soot and tar-like deposits which are often observed on the wall of CVD reactors during carbon deposition.